AMRITSAR, India (Reuters) - A commuter train traveling at high speed ran through a crowd of people on the rail tracks in northern India killing at least 59 people on Friday, state officials said, making it India's worst rail disaster this year. "We have 59 confirmed dead. 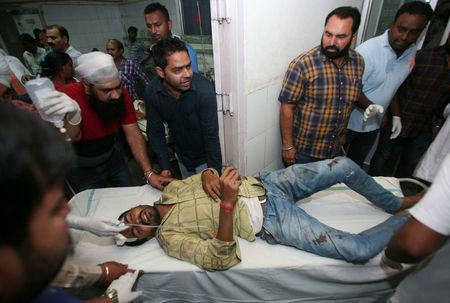 The toll can rise," State police chief Suresh Arora told Reuters, adding emergency officials were still trying to ascertain the extent of the disaster on the outskirts of Amritsar in Punjab state. Police said it was "freak accident" as people did not hear the train approaching amid the din of festivities and fireworks. "We have also ordered an inquiry as to why this incident has taken place," Singh told ANI, adding he did not know why the Dussehra celebrations were being held so close to the railway tracks.